‘Tis the Season for Giving – Please Consider a Year-End Gift! 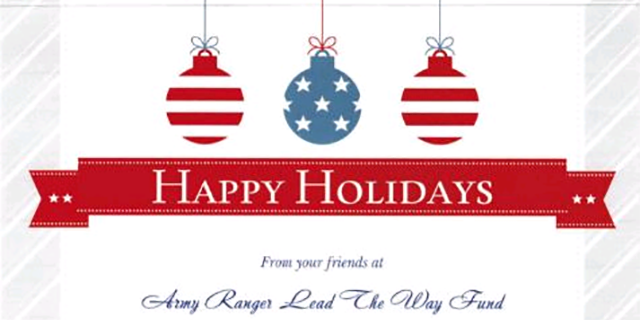 On behalf of everyone at Army Ranger Lead The Way Fund we would like to wish all of you and your families a happy and healthy Holiday Season. As we embark upon the end of 2014, we continue to be humbled and amazed by the generosity and commitment to Army Ranger Lead The Way Fund on behalf the 75th Ranger Regiment and their families. Unfortunately, our work is far from over. The world is becoming more unstable, more unpredictable, and more likely to produce problems that will require the service of our mighty Rangers, for years to come. Needless to say the stress, tension, and pace of life our Rangers and Ranger Families endure is amazing and they need our help more than ever. We hope you will consider a year-end gift in support of these Heroes who put so much on the line for us. Even the smallest donation will go a long way in easing the burden on these men and their families. Thank you for your continued support and dedication. We couldn’t do any of this without you!